I find myself reliving my past a lot more since the stage IV diagnosis. Maybe people’s lives really do flash before them when they’re about die and when they know they’re dying “soon” the process starts and runs more slowly. I’m also spending some serious time getting my photographic legacy in order for my wife. But this isn’t all about the past. There’s still lots of time, even if it’s only a few years, to create a lot of great memories. I’m always trying to find ways to better capture and preserve these memories. An up and coming technology called Life Logging may play a significant role. The idea is simple. You wear a tiny camera that takes wide angle photos “every so often” of what’s in front of you. Later these are edited and assembled into short time lapse movies of what you saw. Or you place the unit somewhere overlooking the area where you want to preserve the action. It sounds perfect to me for bucket list adventures, major family events, etc. Some may even want to wear one almost all the time. The second product is Memonto. It’s slated for availability in April 2013 at a cost of $279 US, as of this writing. It takes a picture every 30 seconds, period. This isn’t necessarily bad. It’s unclear if Autographer’s approach to snapping shots based on a collection of sensors is worth the extra cost compared to simple fixed interval shots. Photos in Memonto are uploaded to a protected web site Memonto hosts where they are geotagged and their computers take an automated first cut at editing the shots into multiple photo streams called “moments”. The user can then re-edit as they please. There’s a documentary on life logging on their site. If you scroll past the halfway point, a large number of photos from a prototype device are shown (at least I assume that’s what they are). They have a pronounced yellow cast. Hopefully, this will be removed in the final product and is not considered an “Instagram filter” look that’s desirable. The company is crowd-source funded through Kickstarter. Both products have batteries that they claim will last at day or two before recharging. They also both claim they’ll have very easy to use software to edit and build the movies. Assuming the cost is reasonable, the software is where the rub will likely be, if there is one (or two). The hardware development needed is more evolutionary than revolutionary. The opposite is true for the software. Based on what little information there is about the companies, it’s hard to tell which one is more likely to produce the best software. Between the two, based solely on the hardware and workflow, I prefer Autographer’s approach. I believe having a collection of sensors decide when to take the shot will result in picture streams that are smaller, more relevant, and need less editing. I also greatly prefer that all Autographer’s pictures will be stored and edited on my local computer instead of requiring an upload to Memonto’s cloud computers to get GPS tagged and edited into moments. Stay tuned. If the initial reviews are good for either product, I’ll probably give ’em a try. We’re back from vacation! We were overseas for almost three weeks. We’ve decided that’s a little too long. It also exposed us to too many cooties on board. Our foursome is now all recovering from moderately severe chest colds. Still, we had a great time. A few notes from the trip. The top two locations visited: La Sagrada Familia and the Leaning Tower of Pisa. La Sagrada Familia is a Gaudi designed church in Barcelona, Spain. Construction started in 1882 and they hope to complete it in 2025, the centennial of Gaudi’s death. It’s interior is finished and is open to tourists. Photographs are permitted. Without question, this is the most incredible, awe-inducing structure of any kind I’ve ever seen. Before this trip, I had no idea it even existed. I almost passed on the trip to see the Leaning Tower of Pisa. After all, I’d seen many, many pictures of it starting back in grade school. It’s a skinny tower they built in the wrong place and it started leaning. I never understood why they didn’t jail the architect, bulldoze the tower, and start over. All I can say is there is something magical about the Tower when you see it right in front of you. I took dozens of shots from all different angles and distances to get just the right shot. It was surprisingly difficult to capture what the Tower felt like to me in one picture. To anyone else, that shot will look like just another shot of the Tower, but to me it is the Tower. As is typical on cruises, the internet access was spotty at best and outrageously expensive. We’re glad to be back in the US and have fast, cheap, reliable access. I confirmed that jet lag does indeed screw up my system something fierce. I again had anxiety attacks in the mornings, this time the worst I’ve ever had. My wife was great helping me through this. I don’t know what I would have done without her. Oddly enough, by the afternoon, the anxiety was always gone. Part of the problem, I’m pretty sure, is my most recent cocktail is a bit of a step back. TMS in late December/early January is looking more and more likely. I didn’t have to deal with jet lag on the way back thankfully – ours was a repositioning cruise for the cruise line, so it was transatlantic at the end. When we docked in Fort Lauderdale, Florida we were only an hour off our home time zone! Stay tuned to Jim’s Pic of the Day for shots of La Sagrada Familia, the Leaning Tower of Pisa, and many others. Note it may be a week or so before they start appearing. 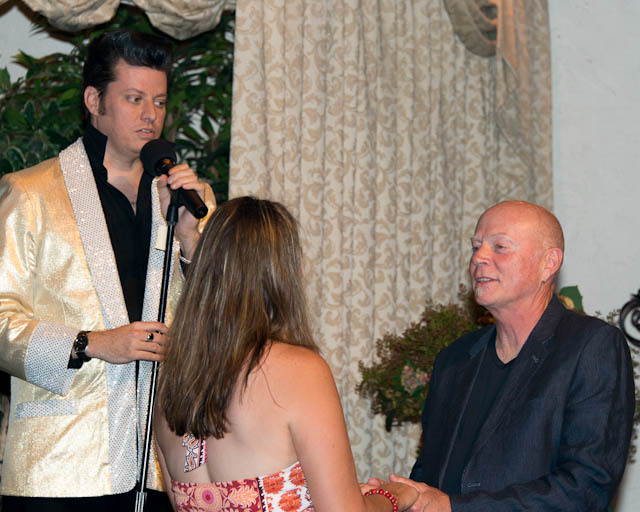 The Elvis wedding in Las Vegas was a blast! After we all were seated a fog machine started up, covering the floor in mist. 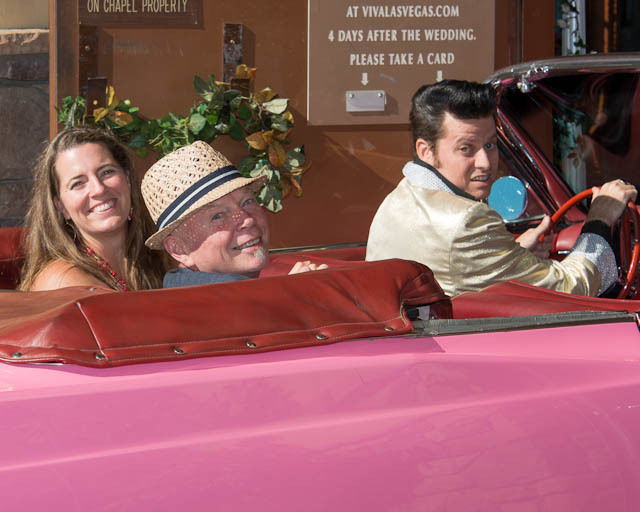 Two huge doors in the back of the chapel opened up and in drove Elvis in a pink convertible Cadillac with the bride and groom in the back seat. Elvis helped them out of the car, they went to their appointed places and Elvis conducted the service, interspersing it with a number of serenades. At the end of the service, we all danced with Elvis singing, and then it was photo time for the family. It was a really incredible time that everyone should experience! About a year ago my wife and I made plans to go to the 500 this year, along with visiting family and friends. This was arranged well before my diagnosis that the cancer had metastasized. It was a great trip, but stressful physically and emotionally. Watching the race was a lot of fun. Temperatures in the low 90s kept us sweating, though. The seats we had were fantastic thanks to the good friend who invited us. I enjoyed taking lots of photos of the race. 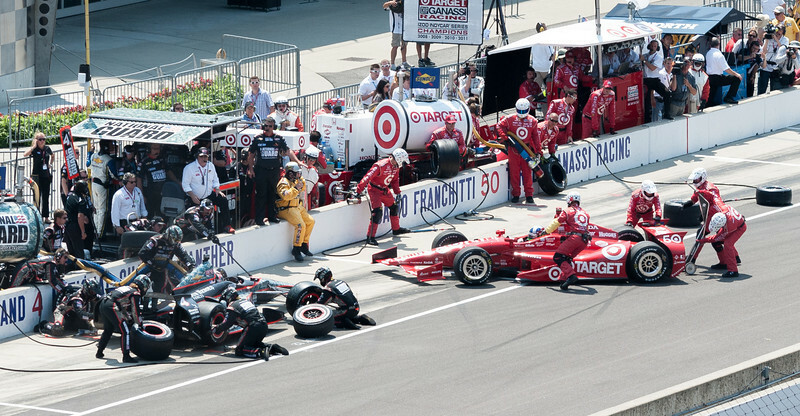 In the shot below Dario Franchitti just damaged his car’s front wing and spun the car around. Despite this serious error he went on to win the 500! Over the course of five days, we met with family or friends every evening. Looking back on it, that was too much. It’s only been in the last few years that I started to become close again with family in that area, so there were lots of questions about my health. AFAIK none of them are following this blog so it make sense. Still, it’s stressful to spend so much time repeatedly describing my cancer and situation. I actually wrote two posts on this, but was never able to get them quite right and finally deleted them. The evenings spent with old friends were very nostalgic. AFAIK they don’t subscribe to the blog either, but asked no questions. I offered to answer any questions they had, and we talked for a short time. All around a much more pleasant interaction. I could tell they were upset that the timeline is potentially so short. We agreed to get together again this fall. It’s sad that good friends can’t remain that way forever. A very bittersweet experience. 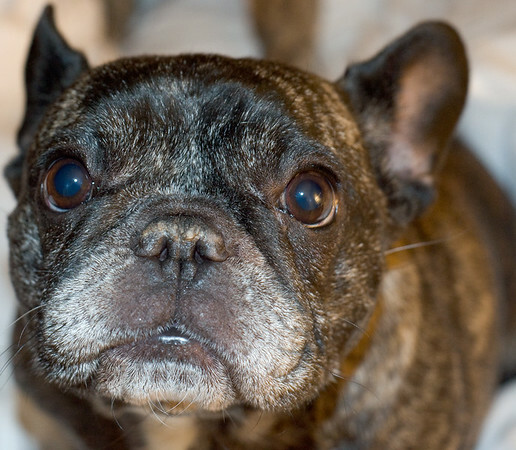 So much for the expectation that after our french bulldog’s cancer surgery that she had a 90% chance of being cancer free. That was just a little over a week ago. 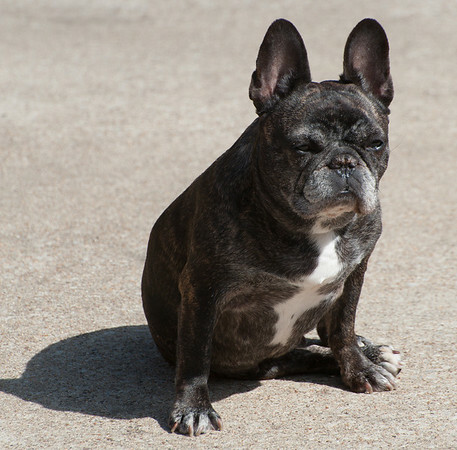 Turns out it metastasized to her lymph nodes and now she has a couple months at best. There’s no treatment, but she’s not in pain. We just wait until she stops eating and drinking to know when it’s the end. What can I say? I’m already missing her. I’m stunned, angry, and very, very sad. I know it sounds crazy, but sometimes it feels like this is all planned. A cycle of bad news followed by good news followed by worse news, etc. I’ll leave you with a couple pictures of her.